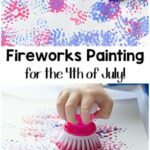 This 4th of July activity looks awesome and was easy enough for my 4-year-old to do! 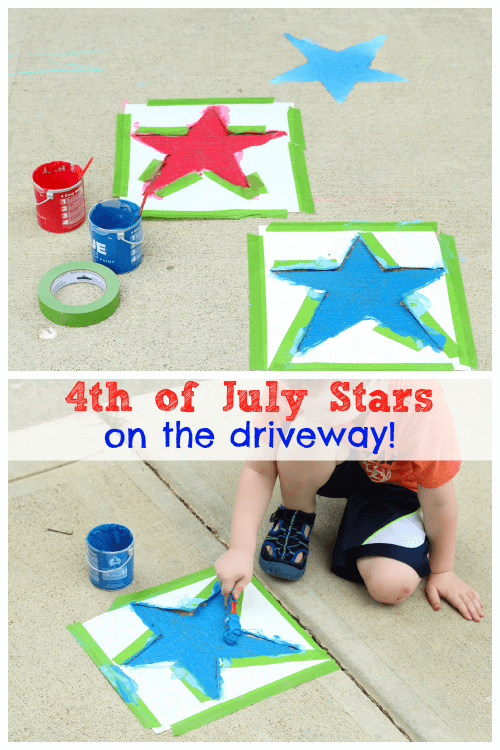 You only need a few supplies to paint stars on your sidewalk or driveway too. Evan is really into sidewalk chalk paint this summer. He practiced writing letters with homemade chalk paint the other day and loved it. He also likes to make roads with the store-bought chalk paint we have and then he drives his trucks on them. 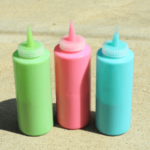 The other day, I was trying to think of a 4th of July activity we could do with the sidewalk chalk paint. 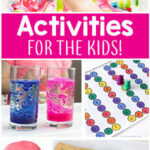 I wanted it to be easy enough for preschoolers to do as well. 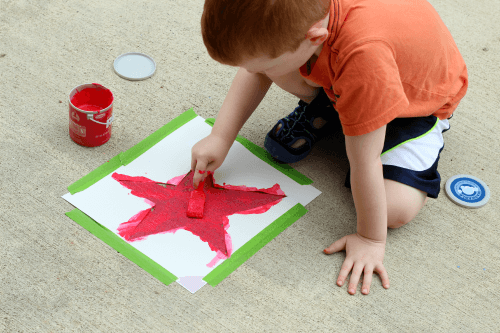 That’s when I came up with the idea to paint stars on the driveway. I think it is a really cool way to decorate your house for Independence Day. Make these patriotic suncatcher stars to go along with them and your house will be decked out for the holiday! 1. 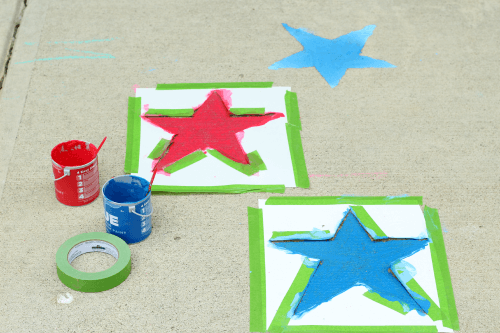 Make 2 star stencils from the poster board. Make them as big or small as you like. 2. Mix up your chalk paint. I used this kind because it came in red, but it still dried fairly pink. I am not sure how it compares to the pink chalk paint that other brands make. We were still very happy with the way it turned out. 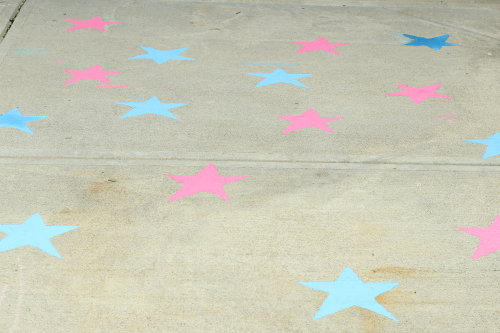 Tape the stencils to your driveway, sidewalk or patio with the painter’s tape. I added a few pieces of tape around the edges of the star as well. I did this to keep paint from seeping under the stencil. Ultimately, it wasn’t much of an issue because the paint was thick enough that it didn’t run. Then paint the inside of each stencil. I made two so that we would have one for the red paint and one for the blue paint. This was also a perfect way for Evan and I to paint the stars together. 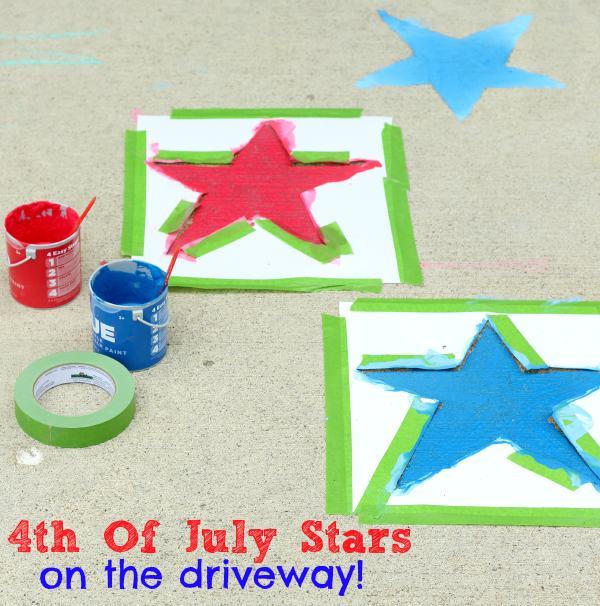 We ended up painting a ton of stars all over our driveway. As you can see, the paint did not stay dark blue and red when it dried. It is darker than this photo shows, especially the blue stars, but the red stars did dry pink. I still think it looks great and would probably look even better with some white stars mixed in. I do plan to try making my own chalk paint with red and blue washable watercolors to see if that works better. 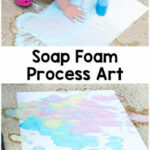 I think this would be a great activity for your kids to do before a 4th of July get together. 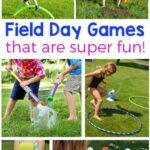 You could even have all the kids do it during your 4th of July party. 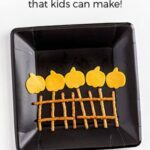 You could make a bunch of stencils of varying sizes and let the kids go to town decorating!